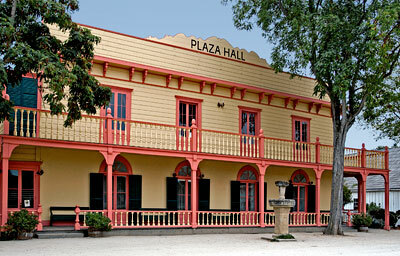 Plaza Hall was originally erected in 1815 as a one-story adobe to house the unmarried Indian girls of the mission. In 1868 a new owner acquired the then ruined mission buildings. He tore down the ruined buildings and reused the good adobe brick for the outwalls of the present two story Plaza Hall. The new second story was of frame construction with a fake front and a two-story veranda across the plaza facade. Source: NRHP nomination for San Juan Bautista Plaza Historic District submitted in 1969.